Paulette Exile was born to Haitian parents in Nassau, Bahamas and ultimately, her parents move to Miami, FL when she was 9 years old. It was a very difficult transition and in her third year of high school, she dropped out. She became a teenage mother at the age of 19 and it was then that she decided not to become another statistic. After obtaining her GED, she enrolled in dental assisting school and furthered her education in Broward College, where she received an AS degree in Dental Hygiene. At present, Paulette is a Registered Dental Hygienist and works in a Cosmetic Dentistry office located in Boca Raton, FL. Friend and mentor Dr. Todd M. Hall Sr. inspired her to write this book and tell her story so that someone who may be struggling with an issue, and may think is too hard for God, would be encouraged to trust God; not just for healing, but redemption, restoration and renewal. 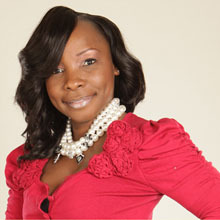 She is a member of Cooper Temple COGIC Upper Room Ministries in Miami Gardens, FL under the leadership of Supt. Marc A. Cooper and Evang. Joy Cooper. It is their leadership and consistent preaching of the unadultrated word of God that gave her the foundation to rightly divide the word of God and assisted her in her healing and deliverance. She resides in Lauderdale Lakes, FL and is the proud parent of Spencer, who is a 21 year old junior in college and Kimberly, who is a 14 year old 8th grader.